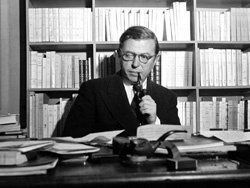 Jean-Paul Charles Aymard Sartre (1905-1980) was born on June 21, 1905, in Paris. His father died when Sartre was only a year old, and he went to live with his maternal grandfather Carl Schweitzer. As a boy, Sartre was small and cross-eyed, and he would search for playmates in the Luxembourg Gardens of Paris. He attended the Lycée Henri IV in Paris, and after his mother’s remarriage, he went to the lycée in La Rochelle. From there, he went to the École Normale Supérieure, graduating in 1929. Sartre made a life-long companionship with Simone de Beauvoir, and due to their resistance of bourgeois values, they never married. During his years in graduate school, he met many great writers of the time, including Raymond Aron, Maurice Merleau-Ponty, Simone Weil, Jean Hippolyte, and Claude Lévi-Strauss. Sartre taught at the Lycées of Le Havre, Laon, and Paris from 1931 to 1945.
the protagonist Antoine Roquetin discovers an obscene excessiveness of the world around him, inducing in his own solitude experiences of a totalizing, psychological nausea. Sartre portrays a horrific rationality and fixity of the banal nature of bourgeois culture, which he compares to an impressive solidity of stones on the seashore. While the publication of his early, largely psychological studies—L'Imagination (1936); Esquisse d'une théorie des émotions (Outline of a Theory of the Emotions), 1939; and L'Imaginaire: Psychologie Phénoménologique de l'Imagination (The Psychology of Imagination), 1940—did not garner much attention, Nausea and the collection of stories Le Mur (Intimacy, 1938) swiftly brought him recognition. In these stories, one can find the currents and themes of Sartre's interest in existentialism and its themes of alienation, commitment, and salvation through art. While teaching at Le Havre, Sartre received a stipend from the Institut Français, allowing him to study in Berlin with Husserl and Martin Heidegger in 1932. He broke from his teaching a second time, when he was drafted in 1939 to serve in World War II. In 1940, he was captured and held prisoner for a year, and upon his release he began teaching in Neuilly, France, and later in Paris, where he was involved in the French Resistance. He and Merleau-Ponty founded a resistance group of intellectuals called Socialisme et Liberté. The German authorities, unaware of his subversive and underground activities, allowed the production of Sarte's anti-authoritarian play The Flies (1943) and the publication of his major philosophic work “Being and Nothingness” (1943). In 1945, he quit teaching and (with de Beauvoir) founded Les Temps Modernes, a political and literary magazine (Sartre eventually playing the editor-in-chief). After the War, Sartre was an active independent socialist, while being critical of the USSR and the US for the cold war. He would soon align himself with the Soviet cause, though he remained critical of their policies. His hopes for communism were ended upon the entry of Soviet tanks into Budapest in 1956. He dedicated a long article in Les Temps Modernes, "Le Fantôme de Staline", condemning both the Soviet intervention and the submission of the French Communist Party to the interests of Moscow. His ongoing critiques of the communists led to the formation of "Sartrian Socialism", which he expressed in the publication of his major work Critique of Dialectical Reason (1960). He was an outgoing supporter of the student movement in France of May '68, rising to unusual heights in his accusation of the Communist Party as having betrayed the May revolution. He remained politically involved by editing and supervising the publication of various Leftist publications. Proclaiming, "Commitment is an act, not a word," Sartre often participated in street riots, in the sale of left-wing literature, and in other activities to promote the revolution. Sartre published his most influential work, L'Etre et le Néant (Being and Nothingness) in 1943, formulating his fundamental system in which "existence is prior to essence". He makes the distinction between things that exist in themselves (en-soi) and human beings who exist for themselves (pour-soi). Human beings live with an understanding of the limits of knowledge and mortality, and therefore in a state of existential dread. The loss of God is not mourned, for humankind is condemned to freedom from all authority, which must be faced if one is to become a moral being. The acceptance of the terrible freedom then requires man to make meaning for himself (by the detachment of oneself from things so as to lend them meaning) and commit to a role within this world—which is futile without the solidarity of others. Sartre's Cartesian view of the world extended to the creation of the world by the self—through detachment, by rebelling against authority, and by accepting personal responsibility for one's own actions, without aid from society, traditional ideas of morality, or religious faith. The realm of the human world as differentiated from nonhuman is characterized by nothingness, by the human capacity for negation and rebellion. The recognition of one's absolute freedom of choice is the fundamental condition for authentic human existence. the purpose of which is to understand human existence rather than the world as such. Adopting and adapting the methods of phenomenology, Sartre sets out to develop an ontological account of what it is to be human. The main features of this ontology are the groundlessness and radical freedom that characterize the human condition. These are contrasted with the unproblematic being of the world of things. Sartre’s substantial literary output adds dramatic expression to the always unstable co-existence of facts and freedom in an indifferent world. Sartre's ontology is explained in his philosophical masterpiece "Being and Nothingness", where he defines two types of reality that lie beyond our conscious experience - the being of the object of consciousness and that of consciousness itself. The object of consciousness exists as "in-itself", i.e., in an independent and non-relational way. However, consciousness is always consciousness "of something", so it is defined in relation to something else, and it is not possible to grasp it within a conscious experience - it exists as "for-itself". An essential feature of consciousness is its negative power through which we can experience "nothingness". This power is also at work within the self, where it creates an intrinsic lack of self-identity. So the unity of the self is understood as a task for itself rather than one that is given. Sartre shifted the locus of his existentialist thought in Critique de la Raison Dialectique in 1960 (Critique of Dialectical Reason) to Marxist social determinism, arguing that the influence of modern society was so strong it produced a serialization, or a loss of self. To regain individual freedom from such forces in society, one must seek group revolutionary action. After close examination, he discovered that the Marxist dialectic did not exist in the Soviet Union, and that it could not within the persecution of individual freedom. He did feel Marxism was too rigid and “universalist” to deal with the ever-changing situations that produce demands particular to existential, concrete circumstances. Such demands are also characterized by “historical materialism”, though they differ for each collectivity, as well as for each individual and their personal freedom. Some philosophers argue that Sartre's thought is contradictory. Specifically, they claim that Sartre makes metaphysical arguments despite his claim that his philosophical views ignore metaphysics. Herbert Marcuse criticized “Being and Nothingness” for projecting anxiety and meaninglessness onto the nature of existence itself—"Insofar as Existentialism is a philosophical doctrine, it remains an idealistic doctrine: it hypostatizes specific historical conditions of human existence into ontological and metaphysical characteristics. Existentialism thus becomes part of the very ideology that it attacks, and its radicalism is illusory”. Philosophers Richard Wollheim and Thomas Baldwin have argued that Sartre's attempt to show that Sigmund Freud's theory of the unconscious is mistaken was based on a misinterpretation of Freud. Sartre was offered the Nobel Prize for literature in 1964 for his autobiography “Words”, though he subsequently rejected the award based on his own notions of his integrity as a writer. His own philosophy bears the influences of the phenomenology of Edmund Husserl, the metaphysics of G.W.F. Hegel and Martin Heidegger, and the political and social theories of Karl Marx into his own brand of existentialism. 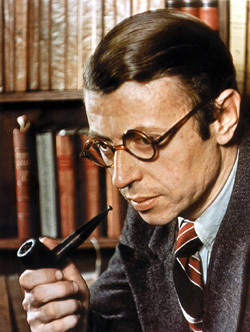 The existentialist humanism, which Sartre championed in his widely read essay L'Existentialisme est un humanisme (Existentialism is a Humanism, 1946), also appears in the series of novels, Les Chemins de la Liberté (The Roads to Freedom, 1945–49). He wrote extensive literary criticism and his other publications include Baudelaire (1947), and a somewhat ethical study on the French writer and poet Jean Genet entitled Saint Genet, Actor and Martyr (1952). From 1960 to 1971 Sartre worked on a four-volume biography on Gustave Flaubert called L'Idiot de la Famille, using Freudian and Marxist interpretations from his other philosophical work. Flaubert had been a childhood preoccupation for Sartre, demonstrating Flaubert to be the person his family and society had determined him to be. By 1971, however, only two of the volumes appeared due to his heart troubles - having suffered two heart attacks at the time. His sight was faltering badly, and though his productivity was lessened, he continued to do interviews and write scripts for motion pictures. A close friend whom Sartre had met in 1970, Pierre Victor, aided him in an endeavor to write a book on ethics, with Victor reading to Sartre the articles and books that he could no longer read on his own. They engaged in discussions on the subject. With de Beauvoir, Sartre attempted to capture their dialogues of his autobiography on tape, though his health after the second heart attack left him in frail condition. However, Sartre was never much more than an icon of the counterculture. Until his death in 1980, he remained a tremendously prolific and outspoken writer and embodied the conviction that philosophy, if it is to be serious, must be lived. In 1980, he was hospitalized for edema of the lungs, his health worsened, and after a month he lapsed into a coma, dying two days later.